Transformer oil conditioning is very essential if we seek transformer reliability, performance and durability. Transformer’s insulating oil must be free from moisture, dissolved gases and particles which accumulate as the oil ages. Even new oils require treatment to bring these contaminants to more acceptable levels. Globecore offers oil processing equipment while the transformer is either energized or de-energized. On-line oil treatment on energized transformer (processing of the oil on energized transformer) is useful in high ambient air humidity. Another reason for on-line oil treatment is high grade of transmission network utilization. As a rule power generation and transmission companies cannot afford to cut energy supply for their customers. This is a case where on-line transformer oil purification is needed. Energizing of transformers and de-energizing them causes profit losses for their owners. Time needed for energizing and de-energizing of transformers can be significant and may result in production process shutdown. For a short time the transformer must be disconnected from the grid in order to install Globecore transformer oil purification plant (if power substation is 15 kv+). Oil hoses must be connected from plant inlet to transformer lower flange and from Globecore plant outlet to transformer upper flange. After installation of oil purifier, the transformer can be reconnected to the grid. Special sensors must be installed to the transformer in order to avoid conservator oil level drop during treatment. 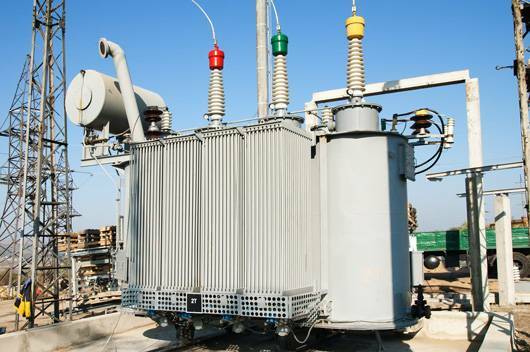 Other special devices must be installed on the transformer, in the oil treatment plant and on the connecting oil hoses for safety.Transformer Oil treatment on energized transformer does not affect the internal oil circulation in the transformer too much as oil remains on the same level. After energized work is done, the transformer must be disconnected from the grid again in order to disconnect Globecore transformer oil purification plant. After the plant is disconnected, the transformer can be reconnected to the grid. For oil treatment while the transformer is energised a bit of preparation is required, of which the most important one is a DGA-Dissolved Gas analysis. The DGA must be passed and be acceptable before any energised work is done. Plant must be full of clean dry oil before being connecting to the transformer. Open slightly the inlet and outlet valves to drain any free water and sludge. If connected to conservator, ensure no water, sludge or debris is present in the conservator. Once oil hoses are connected (transformer valves closed), recirculation through the plant and hoses must take place to remove air and stabilise the plant. Once the plant is running at operational temperature, slowly open the inlet and outlet valves. On shut down switch heaters of 20 minutes before plant shut down. After the heaters are switched off, start reducing flow rate to as slow as possible. Shut down the plant, close the valves, disconnect hoses and power supply. Transformer oil treatment while transformer is in energized condition using Globecore high-vacuum degasifier (Work on GRIDCo (Ghana) transmission utilities).